(3/05) This is an exclusive interview of the great Nightcrawler of the video game translation scene! It is because of him and the efforts of others that we have an English translation available for Dual Orb 2. I'm eternally grateful for all of his hard work and devotion. He's most definitely an Internet celebrity in my eyes. Now on with the interview! Q: So Nightcrawler, can you tell us a little about yourself? My real name is Nightcrawler. I had it legally changed in court a few years ago.. just kidding.. It's actually Steve! I'm currently 23 and one of the old timers here in the scene. I'm an Electronic Engineer working at a crappy company I'm trying to get out of. I'm going to move into Software Engineering. I want to be a lazy programmer. ;) Outside of work, I spend time improving my piano playing skills, weightlifting, video game playing, watching movies, and spending time with friends and family. I currently live alone, but have been with my current girlfriend for almost 5 years, so that may change soon! Then again, I like being messy and being king of my domain. Sharing time is over. Next question! Q: When did you get into working on translation projects? I got into translations sometime in 1997, but have been romhacking since 1996. At that time I was doing Mario Hacks since that was the thing to do back then! You can still download my first hack, ‘Quest for the Missing Hat' from my page. Translation Corporation was founded in 1997 and we were one of the groups working on FF3j. I am mentioned in the readme of J3d's (Founder of DeJap) DQ6 patch. I was involved in a few misc. things back in the day with him. On a side note, Stovetop from J2E fame use to work for me on the FF3j translation. Quite a few people were under my tutelage at the time. In 1998, I was involved in a near fatal car accident and sustained a severed collar bone, 5 broken ribs, and a cracked hip and a concussion. With this, the FF3j project died and I was out absent from the scene for a long time. TransCorp was officially dead for 4 years I think. Though, I was probably only gone for a year or two. After that, I was one of those people who was still involved in the scene, but never officially. The details are so sketchy in my memory these days. That's about all I can remember. In any event, I've been around since 1996 in one form or another. I've spent a good deal of my time teaching other people rather than doing projects myself. To this day I'm still helping other romhackers! :) While my official scene resume may look a little lacking.. rest assured.. I've been around a long time and done quite a bit. Q: What got you into them? I'd have to say my want to hack games started when I first found out you could alter Super Mario Brothers. I always had aspirations, even at that young age, to make a game of my own. Romhacking was a way to make that happen without knowing a whole lot. (I was 15 at the time and didn't know any programming aside from BASIC.) Interest in hacking Mario sort of died off quickly though. It was nice to modify the game in your own way, but it was still the same game at heart. It had the same music, same levels, same everything. It was just cosmetically different. There was no chance at that time of editing levels or anything like that. No one had the utilities or knowledge. There weren't even any assembly level tools at that time to my knowledge. I had always been an RPG fan since I was young (I got Dragon Warrior ONE when it was new!). Once ROMs started circulating around, I got exposed to the horrible fact that Japan had many NES games that we did not have!! 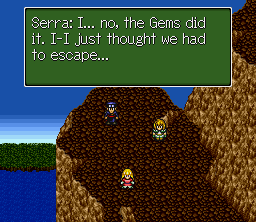 I, being a fan of FFI and FFII in the US, found out we missed out on other FF games. I then found out that with my limited skills from hacking Super Mario Brothers, I could alter the text in these Japanese games as well! About the same time I found this out, many other people did as well, which was a boom and the real beginning of the translation scene. 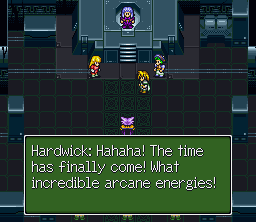 Thus, I got involved with the FF3j translation. I don't believe anyone had ever completed a translation yet when I started. 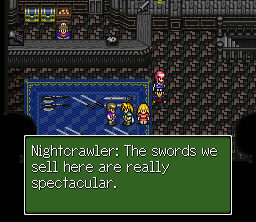 That may have been why the FF3j wars were so heated. When we started, there was still no such thing as ASM modifications. We used squishy tiles (man how I miss the squishy tiles!) and moved around some string end control codes. Even hacking pointers was new at the time. So, I was amongst the first in the translation scene. Who knows.. had I not gotten into that car accident I may have had the first ever completed translation. I was in the lead for a while. Q: What influenced your decision to work on Dual Orb 2? The decision to work on Dual Orb 2 was difficult. There were still mountains of games un-translated to choose from. Being an RPG fan, I knew I definitely wanted to do one of those. Being a non-Japanese reader and not being able to understand the story well, picking out a GOOD RPG was a hard thing to do. The first thing I would do is play through as much as I could of them. I felt it was important for the game to have a fun battle system; top-notch music, effective graphics, and some sort of presentation that convinced me it could do a good job of delivering the story. This was most effectively evaluated by simply playing through the game. For a Japanese game to hold my interest long enough to play through it almost in it's entirety, without understanding the story, it's got to be fun and have something about it that keeps me playing. Dual Orb 2 had these qualities. It had a unique weapon system, beautiful graphics, and an amazing soundtrack and was just plain FUN to play. After initial screenings, I often asked some online acquaintances that did know Japanese to give me a brief summary of some of these RPG's that I was considering. Dual Orb 2 just had everything going for it. It had everything I was looking for and the search for a gem to translate was over. Q: Did you do anything special to prepare yourself for Dual Orb 2? Yeah, Dual Orb 2 did require some preparation from me. This marked the first SNES project I was going to handle myself. It was a bit different from the NES. There was a lot of learning involved as I went along in Dual Orb 2. I already had assembly, general programming, and romhacking skills, but I had to learn the SNES hardware, memory map, and various other things unique to the SNES. Because Dual Orb 2 was a very technically challenging game for even the best hacker, I was going to have to hack the game on a much deeper level than I had done before dealing with plenty of compression and lots of code reverse engineering throughout the project. I got some initial help in the right direction from Bongo' and Byuu. These days I consider myself as one of the most talented and skilled SNES romhackers around and have made it a point to help out and share some of my knowledge with up and coming hackers who want it. A great deal of my time is spent working and helping other hackers rather than working on my own projects. I am a big believer in the romhacking community. There are not enough of us to go around and we need to help each other out whenever we can. Because all these games are uniquely programmed, even the veteran hackers can learn a thing or two from fellow hackers who have worked on other games. Q: What problems did you encounter during the Dual Orb 2 project? And what did you do to correct them? I still have a news archive up on the site. That is a good outline of technical problems to the entire project for anyone interested in more detail than I am about to give. Most of the challenges were mentioned in my updates. The Dual Orb 2 project was plagued with technical problems. Many of the games that haven't been translated yet are left because they were too much of a technical challenge for many of the hackers that have tried. Dual Orb 2 was one of these games. Several other groups had attempted translation of Dual Orb 2 and given up in frustration. Q: Overall, do you think working on Dual Orb 2 was worth all the hard work you put into it? There were times where I doubted finishing Dual Orb 2 was worth the effort and I almost considered giving up a time or two, but in the end it was worth it. It was never apparent to me during the project how many people would actually benefit from this translation. During the project, we romhackers don't get too many support e-mails. Sometimes it seems like there is not a lot of interest. But, after the patch release, it was an eye opener to see just how many people would get hours of entertainment from the work I did. Finishing the project for myself gave me a sense of personal accomplishment and satisfaction of technical achievement, but finishing the project so other people could enjoy a game they would otherwise never have the chance to was even more rewarding. So, despite the struggles, I do believe it was worth it both on a personal level and a public level. Anyone who talks about Dual Orb 2 in English is talking about my work.. They enjoyed those fun 20-30 (in some cases MANY more) hours because of me and that's a good feeling. Q: I would like to close the interview with this last question. What gave you and continues to give you the will and enthusiasm to keep you going with translation projects? Do you have a personal goal or mission? What makes Nightcrawler tick? Well, romhacking is a hobby. If you're not doing it for yourself, you shouldn't be doing it. Marginal fame and attention is nice, but you shouldn't be hacking a game for other people. I do this because most of the time it's pretty fun. I enjoy the challenge of whipping a game into shape to do my bidding. Sometimes, I both love and hate the work. Some challenges are frustrating, but at the same time it's fun to work on trying to figure out a solution. The tedious, boring work is hard to get through sometimes, but to finish the project, it's got to be done. Sometimes, the support and marginal fame and attention from others help get you through those times. I have a love for the SNES and video games in general. I have the skills to give people a game they can enjoy that they would otherwise not have the experience to enjoy. The possibility of offering thousands of people hours of enjoyment is motivation. Personal technical achievement is motivation.. problem solving is motivation.. My motivation comes from many sources at different times. There are time I have no motivation at all and take a mini vacation.. but sometimes I continue doing it just because I CAN! Hehe There you have it! Some insight into the twisted world of Nightcrawler.